Buddhism is a minor religion in the Philippines. The Main Altar of a Buddhist Temple in Masangkay Street, Tondo, Manila. Loanwords with Buddhist context appear in languages of the Philippines. Archaeological finds include Buddhist artifacts. The style are of Vajrayana influence. 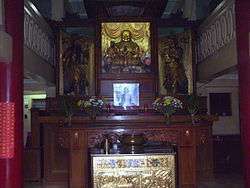 No written record exists about the early Buddhism in the Philippines. The recent archaeological discoveries and the few scant references in the other nations’s historical records can tell, however, about the existence of Buddhism from the 9th century onward in the islands. These records mention the independent states that comprise the Philippines and which show that they were not united as one country in the early days. The Philippines’s early states must have become the tributary states of the powerful Buddhist Srivijaya empire that controlled the trade and its sea routes from the 6th century to the 13th century in Southeast Asia. The states’s trade contacts with the empire long before or in the 9th century must have served as the conduit for introducing Vajrayana Buddhism to the islands. Both Srivijaya empire in Sumatra and Majapahit empire in Java were unknown in history until 1918 when the Ecole Francaise d’Extreme Orient’s George Coedes postulated their existence because they had been mentioned in the records of the Chinese Tang and Sung imperial dynasties. Ji Ying, a Chinese monk and scholar, stayed in Sumatra from 687 to 689 on his way to India. He wrote on the Srivijaya’s splendour, "Buddhism was flourishing throughout the islands of Southeast Asia. Many of the kings and the chieftains in the islands in the southern seas admire and believe in Buddhism, and their hearts are set on accumulating good action." 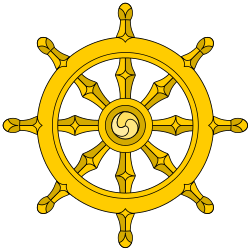 Both empires replaced their early Theravada Buddhist religion with Vajrayana Buddhism in the 7th century. The Srivijaya empire flourished as a Buddhist cultural centre over 600 years from 650 to 1377 in Palembang, Sumatra. Built as a mandala on a hill from 770 to 825 in central Java, the Borobodur stands today as the living testament of the Srivijaya empire’s grandeur. Three generations of the Sailendra kings built the temple that displays a three-dimensional view of the Vajrayana Buddhist cosmology. Later on, the Javanese Majapahit empire took control over the Srivijaya and became the leading Buddhist cultural centre from 1292 to 1478 in Southeast Asia. Ritual practice rather than meditation makes Vajrayana Buddhism distinct from the other forms of Buddhism. Vajrayana Buddhism was also known as Tantric Buddhism and Mantrayana, the esoteric teaching, which was conveyed only by a master to a disciple through initiation or empowerment. Vajrayana means Adamantine Vehicle or Diamond Vehicle that shows the way to awaken the Enlightenment. Mantrayana comes from the word mantra, which means words (incantation, spell, oath) of special vibrations. Mantrayana makes use of upaya or skillful means, such as the mantra and the mandala. They serve as aids to mind cultivation. The Mantrayana practitioner visualizes the mind as a mandala that expresses the mind’s innate nature as the ahistorical Buddha or Enlightenment, which means the Absolute in its emptiness and which has no beginning and no end. he mind is its sacred dwelling place. The Mantrayana practitioner sees her/himself as divine because, according to the Mahayana Buddhist perspective, their mind has been endowed with the ahistorical Buddha or Enlightenment nature. It is also known as the Dharma nature, the eternal law that governs the universe. The Philippines’s archaeological finds include many Buddhist artifacts. They have been dated to belong to the 9th century. The artifacts reflect the iconography of the Srivijaya empire’s Vajrayana Buddhism and its influences on the Philippines’s early states. The artifacts’s distinct features point to their production in the islands and they hint at the artisans’s or goldsmiths’s knowledge of the Buddhist culture and the Buddhist literature because the artisans have made these unique works of Buddhist art. The artifacts imply also the presence of the Buddhist believers in the places where these artifacts turned up. These places extended from the Agusan-Surigao area in Mindanao island to Cebu, Palawan, and Luzon islands. Hence, Vajrayana Buddhism must have spread far and wide throughout the archipelago. And Vajrayana Buddhism must have become the religion of the majority of the inhabitants in the islands. The gold statue of the deity Tara is the most significant Buddhist artifact. In the Vajrayana Buddhist tradition, Tara symbolizes the Absolute in its emptiness as the wisdom heart’s essence that finds its expression through love and through compassion. The Vajrayana tradition also tells about the outpouring of the human heart’s compassion that manifests Tara and about the fascinating story of the Bodhisattva of Compassion shedding a tear out of pity for the suffering of all sentient beings when he hears their cries. The tear created a lake where a lotus flower emerges. It bears Tara who relieves their sorrow and their pain. The Golden Tara was discovered in 1918 in Esperanza, Agusan and it has been kept in the Field Museum of Natural History in Chicago, Illinois since the 1920s. Henry Otley Beyer, the Philippines’s pioneer anthropologist-archaeologist, and some experts have agreed on its identity and have dated it to belong within 900-950 CE, which covers the Sailendra period of the Srivijaya empire. They can not place, however, the Golden Tara’s provenance because it has distinct features. The golden-vessel kinnari was found in 1981 in Surigao. In Buddhism, the kinnari, a half-human and half-bird creature, represents enlightened action. The Buddhist Lotus Sutra mentions the kinnari as the celestial musician in the Himavanata realm. The kinnari resembles the chimera or the harpy in the Greek mythology. The kinnari takes the form of a centaur, however, in India’s epic poem, the Mahabharata, and in the Veda’s Purana part. The other finds are the garuda, the mythical bird that has been common to Buddhism and Hinduism, and several Padmapani images. Padmapani has been also known as Avalokitesvara, the enlightened being or Bodhisattva of Compassion. Estimates of the Buddhist population of the Philippines is at 2%. Several schools of Buddhism are present in the Philippines. There are Mahayana and Vajrayana Buddhist temples as well as Theravada followers, lay organizations, meditation centers and groups, such as Pure Land Buddhism, Soka Gakkai International which is an international Nichiren Buddhist organization founded in Japan. The Maha Bodhi Society's Zen circle was founded in October 1998. ↑ "Directory of Buddhist Organizations and Temples in the Philippines". Sangha Pinoy. Archived from the original on 20 August 2008. Retrieved 13 May 2008. Almario, Virgilio S. ed., : UP Diksiyonaryong Filipino. Pasig City: 2001. Legeza, Laszlo, "Tantric Elements in Pre-Hispanic Philippines Gold Art," Arts of Asia, July–August 1988, pp. 129–136. Peralta, Jesus, "Prehistoric Gold Ornaments CB Philippines," Arts of Asia, 1981, 4:54–60. Religious Demographic Profile, The PEW Forum on Religion and Public Life. Retrieved 2008. Thomas, Edward J., The Life of the Buddha: As Legend and History. India: Munshiram Manoharlal Publishers, 2003.